What is Pro Coenzyme Q10? Coenzyme Q10 provides powerful antioxidant benefits and protects cells from the damaging actions of free radicals produced as waste products during energy metabolism. Coenzyme Q10 supports cardiovascular function and is ideal for use by people who have cardiovascular disease, mitochondrial disorders, cognitive dysfunction, headaches, poor energy levels, or muscular ailments. It has been shown to alleviate chest pain, dyspnea, and palpitations. Treatment with coenzyme Q10 has even been shown to restore normal heart size and function in some patients. Coenzyme Q10 is used by doctors along with standard medication for the treatment of congestive heart failure and is an approved drug in Japan. 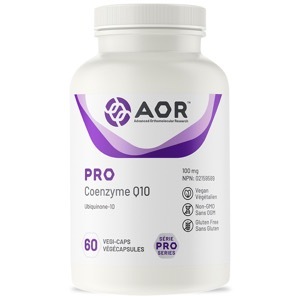 AOR's Pro Coenzyme Q10 provides an effective dosage of ubiquinone in its simplest form. Adult Dosage: Take 1 capsule one to three times daily with a fat containing meal. Cautions: Caution in patients taking blood pressure medication or blood thinners.